In 1970, St Andrews students elected John Cleese as their Rector and chair of the University Court. Cleese’s installation marked the first Rector of St Andrews to have film and television stardom, the first Rector to appoint a student as Assessor, and at 6 feet 4 ¾ inches, he became ‘the tallest Rector in the history of the University’ (Citizen, 21 November 1970). As Cleese noted in his Rectorial Address, ‘For the first time in St Andrews’ long and distinguished history you have elected a “Silly Rector”. Where stood John Stuart Mill, Balfour, Sir James Barrie, Kipling, Earl Haig, Smuts and Sir Walter Scott, now stands a 31-years-old TV funny man […] an electronic buffoon’ (Citizen, 24 April 1971). After the Second World War, film and television stars, with merits often perceived through their fame, became candidates for rectorships. From Alastair Sim in 1948 at Edinburgh, to Stephen Fry in 1992 at Dundee, comedy stars proved popular choices amongst university students. Cleese’s election reflected a student desire to be represented by someone nearer their age, an iconoclast from outside the status quo; indeed, he was looked on with dismay by many who feared that the office would be reduced to a ‘spectacle’ like ‘the television show’. National newspapers stoked fears with headlines such as ‘Monty Python’s flying rector’ (The Guardian, 21 April 1971). Forty years later, Cleese’s work in film and television continues to define him as a star, but in coming to know the man, St Andrews grew to appreciate him differently. 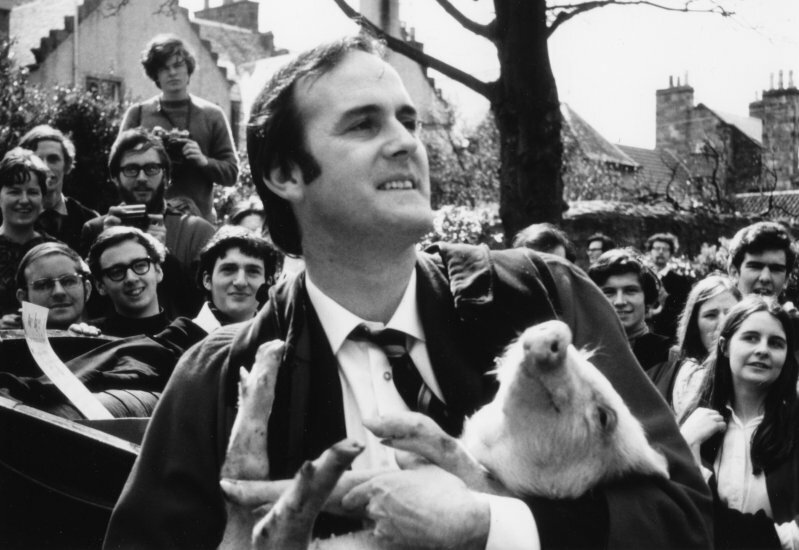 Despite Cleese’s sincere desire to be a working Rector (the first in twenty years), he was aware of the derision arising from his star status, and used self-deprecating humour, beginning with his Rectorial Address, to win over academics, students, and the press. A witty satire of J.M. Barrie’s address on courage, extolling instead the merits of ‘cowardice’, Cleese’s Address expressed radical anti-war sentiments, reflecting the activist, politically engaged 1970s St Andrews student population – but no offence was taken; he delivered it with comic invention. Over the course of his term, Cleese performed with students for the Students’ Charities Campaign, addressed the community Round Table, participated in St Andrews Day, and officially opened the Student Union. Any initial fears regarding his capability were quelled. One professor at the opening of the Union praised the Rector, ‘John Cleese has brought a new meaning to the rectorship. On the Court he has always safeguarded the students’ rights. He has been one of our most successful rectors. More than being a rector, he and his wife have played a part in University life’ (Citizen, 21 April 1973). Upon finishing his term, Cleese was honoured as a regent of the colleges of St Salvator and St Leonard, and his character from the ‘Ministry of Silly Walks’ has become a popular figure in the Kate Kennedy Procession. While Cleese may have been fun, he was in no way a ‘Silly Rector’. The placement of his name among the notable rectors of St Andrews indicates that his comedy star status evolved from suspicion to respect as the University grew to know him. ‘Students’ New Rector.’ St Andrews Citizen, 21 November 1970. ‘Monty Python’s flying rector.’ The Guardian, 21 April 1971. ‘Cleese on Cowardice, New Rector makes good impression, Drag and Installation Scenes.’ St Andrews Citizen, 24 April 1971. ‘John Cleese Opens New Union.’ St Andrews Citizen, 21 April 1973. Wintersgill, Donald. The Rectors of the University of St Andrews, 1859-2005. Edinburgh: Dunedin, 2008.